Ever since the Reconquista, Muslims in the Iberian Peninsula and North Africa have yearned for the day when Al-Andalus would be theirs once again. That day has moved perceptibly closer during the last ten years, since it is no longer possible to name a nightclub for Mecca, although previously it was no problem. Spain — or at least the city of Aguilas — is prepared to enforce sharia law on behalf of the world’s 3.88 octillion offended Muslims, and has caved into their demands in the face of threatened violence. A popular Spanish disco, La Meca, sees itself forced to change its name because Muslim extremists have threatened “a big war between Spain and the Islamic world.” This is what the Spanish newspaper El Pais reports. Employees of the Spanish secret service have warned the owner of the disco [pdf] in the southern Spanish city of Aguilas (Murcia) that the club is a potential target for extremists. 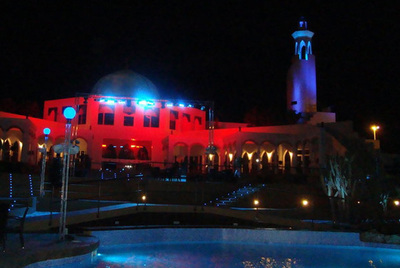 The nightclub looks like a mosque. One of the owners is in fact the former Valencia goalkeeper Santiago Cañizares. Hackers have cracked the club’s website and put a video message on it which threatened a world war if the club doesn’t change its name. The owners have met with a number of local Muslim leaders and decided to change the name. The club was very popular in the eighties and nineties and also then already was called La Meca. Later on the club was closed for ten years. The club reopened June 18 this year, with the same name, but now this is meeting with enormous resistance. Mohamed Ali, head of the Spanish Federation of Islamic Religious Affairs, considers it disrespectful to name a place where there is drinking and dancing after an Arab city. Muslims pray toward Mecca and the Prophet received the Koran there. Iran also interfered with the name of the Spanish dancing club: the Iranian state radio announced that it took the name as an insult. [picture caption] Spain has long been a target for al-Qaida terrorists. They want the south of Spain reinstate Islamic law. In 2004, four Islamic terrorists blew up four metro trains packed with commuters, killing 191 people. I visited Murcia almost twenty years ago. Even then, there was a large Muslim population and in parts of the small city, I felt unsafe. The should rename it "the Goatf***er". The war cannot be far off. It can only be a matter of time before one of these incidents results in a major confrontation. The U.S. with current leadership would naturally back down. Some other incident will occur after that. It then becomes more and more difficult to keep backing off. Of course, a nuke could easily enter the picture and speed up the entire process. This is known as sharia creep. It starts out as Muslims demanding they be allowed to use sharia law in their self-segregated ghettos. Then, non-Muslims are guilted or threatened into abiding by sharia law as well, e.g. the ban on any criticism of Islam, Mohammed or Muslims including satirical cartoons. Next, non-Muslims are instructed not to eat at work when Muslims are fasting and so on it goes, step by step, inch by inch. You give a Muslim an inch, he takes a yard. The Arab version of this saying is "Let a camel's nose in the tent, and the rest of him will soon follow". These muslim retards seem to assume that they can pontificate worldwide,what happens in spain or anywhere else,is no-one business but the spaniards,how about telling the saudis to change the name of mecca because the people at the disco want to get pissed without medieval conotations of religious intollerance,which spoil the pursuit of sexual gratification. Clearly, on March 11, 2004 almost 200 Madrileños died and nearly another 1,000 were injured in vain. joe six-pack: The war cannot be far off. It can only be a matter of time before one of these incidents results in a major confrontation. The U.S. with current leadership would naturally back down. Some other incident will occur after that. @Zeke: Sounds like a plan. @laine: Not only the rest of the camel, but plenty of camel excreta as well. I love this blog but never posted anything until today. If Spain had any desire to return to its 'glorious' past before it was violated by the musulmanes and beaten into harmonious submission, it should support the club in keeping its name. Little by little the former conquering cultures are being stomped by the more oppressive ones. islam (I won't capitalize it) will make certain they remain submissive. Little by little the former conquering cultures are being stomped by the more oppressive ones. islam (I won't capitalize it) will make certain they remain submissive. Serves them right for selling out. The US needs to learn and prepare. We won't be able to breathe without these nomads ruling everything.